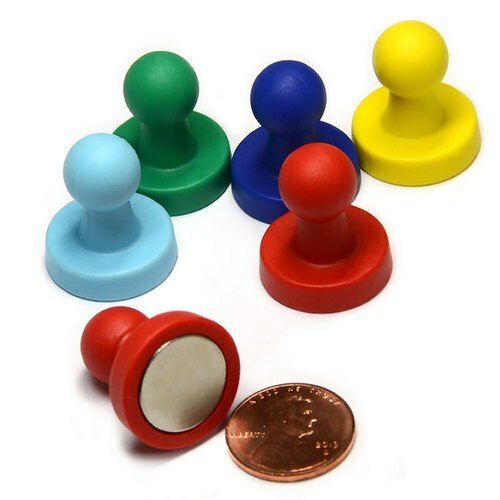 This listing includes a dozen large magnetic push pins which is 5/8" in diameter and 3/4" high. A single pushpin can hold up to 21 pieces of 20 lb papers to a metal plate. The results may vary when it's applied to other surfaces. CMS Magnetics NeoPin® is made of patent licensed super powerful neodymium magnets. These large magnetic push pins are made to replace traditional push pin tacks. It becomes more and more popular since it does not have needles and the magnetic whiteboards become much popular these day. It's a wonderful item for schools, offices, restaurants and warehouses. It can be used to hold notes, flow charts, maps, technical drawings and restaurant orders etc. onto magnetic surfaces. You can use these products on school lockers, home fridges and office cabinets. Note: Each set contains 12 pieces of single color of large magnetic push pins but the actual colors are based upon availability. The available colors are blue, light blue, red, yellow and green. The following is the reference for the holding power of each of the large magnetic push pins. The testing was done on the 20 lb A4 printing papers. 3 pages on glass magnetic board.